Raleigh-Durham International Airport Parking Your car can pay for your parking space. Raleigh-Durham International Airport Parking : When you think of driving to an airport, either to travel or to pick up a passenger, you get so many questions crisscrossing your mind. You cannot help but think of how to beat the traffic and where to park at the airport. Some interpret it as a difficult task that is too heavy a burden to bear. That is the reason many travelers opt to have someone drive them to the airport or take a taxi. Did you know that TravelCar can drastically reduce your travel worries? If you have had instances whereby you pay more for parking at the airport than expected, you may want to consider a cheaper parking alternative. Compare and contrast parking prices from a wide array of companies at Raleigh-Durham International Airport (RDU). TravelCar is determined to help you hack the parking activity that is strenuous and expensive in many cases. Airports are continually hiking their parking fees so you may miss out on the updates. Parking with TravelCar ensures you get information on time through our numerous communication channels. Find us in nearby seaports, airports, train stations and cities neighboring Raleigh-Durham International Airport. For a seamless experience make your bookings early before the date of your flight. All our services, that is, valet parking, cheap airport parking areas, car rentals and car listing services are only accessible after one has booked for the same on our website www.travelcar.com. We are a reliable parking service provider that you can depend on to give cheap airport parking solutions. Call us up on the number +1 888-807-0209 or chat with any of our agents on social media and our website. Raleigh-Durham International Airport is situated in Cedar Fork Township of Wake County in the State of North Carolina. The U.S based airport is 7.2 kilometers North-East of Morrisville, Wake County. Raleigh-Durham International Airport is 10 miles North-West of Raleigh Downtown and 10 miles South-East from Durham Downtown. Raleigh-Durham International Airport provides airline services to Durham, Research Triangle Metropolitan Region, and Raleigh. Raleigh-Durham International Airport was opened for business on 1st May 1943. 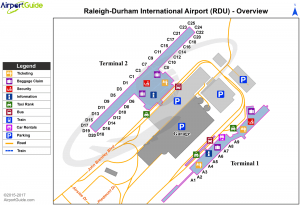 Research Triangle owns Raleigh-Durham International Airport whereas the Raleigh-Durham Airport Authority focuses on management and operations at the airport. The airport is a focus city for Frontier Airlines and Delta Air Lines. Raleigh-Durham International Airport ranks the 38th busiest airport in the United States of America and the 2nd busiest airport in North Carolina after Charlotte Douglas with a total passenger boarding of 11,653,086 passengers in 2017. Raleigh-Durham International Airport has also facilitated 199,828 aircraft operations in 2017. Raleigh-Durham International Airport has two terminals, three concourses, three runways and 45 gates. Worry no more about exorbitant airport parking prices. We have a regulated parking pricing at Raleigh-Durham International Airport. We have cheap airport parking prices that all travelers can afford. Our valet parking services are also pocket-friendly. Prices go even lower if you list your vehicle for use by other travelers. You may end up saving some money from the venture. Our website provides a platform where you can get informative content regarding parking prices in your respective airport of choice. We issue quotes on valet and parking services. Additionally, we advise on areas of interest that you can visit. We give bonuses to clients who book very early for our services. These bonuses are mainly on parking prices. We want you to enjoy parking at the airport, not to despise it. Choose TravelCar services, and all your parking tribulations will be history. Find our services in airports, seaports, downtowns, train stations and hotels neighboring Raleigh-Durham International Airport. The main ports in North Carolina are Port of Wilmington, Port of Morehead City, and Military Ocean Terminal Sunny Point. Raleigh-Durham International Airport has two passenger terminals with three concourses. Terminal 1 has Concourse A hosting nine gates. Terminal 2 has two concourses: Concourse C has 14 gates, and Concourse D has 17 gates. We mind the security of your vehicle. TravelCar’s parking lots are adequately secured with guards, gates and CCTV video surveillance. Offsite airport parking is generally safer than on-airport parking due to spacing and order at the parking area. Moreover, our slots are covered to protect your automobile from harsh weather conditions such as hailstorms and excessive sunshine. We have car maintenance services in our parking areas. You can have your car hand-washed. Additionally, you may request for car detailing services such as interior vacuuming, car waxing, car polishing, and compound car buffing. TravelCar has a ride-sharing service to ferry clients from our off-site parking area to Raleigh-Durham International Airport terminals. Our shuttles frequently leave for the airport that is about ten minutes away. You also get luggage assistance to your point of departure. Our valet parking services are available for clients ever in a rush or those who love the service. Valet parking is available 24/7 throughout the year. TravelCar has a team of professional valet attendants who can handle different models of automobiles. There is a car rental program at TravelCar for clients in need of a vehicle to specific destinations in the State of North Carolina. You can book any vehicle from our fleet. We provide cars to suit your financial budget and the occasion you want to attend. Moreover, you have the option to choose a vehicle that suits the topographical area you intend to visit. Some travelers may have extremely long trips away from North Carolina. They have an option of listing their vehicles to be used by other passengers. In so doing, they earn income for every mileage. What makes the deal even sweeter, is that TravelCar shoulders a majority of the insurance and maintenance costs. Valet parking is whereby an organization’s attendant handles the parking of your car on your behalf at a stipulated fee. At TravelCar, we have an active team of valet professionals out to park your car most quickly and safely in designated parking locations. You can access valet parking 24 hours on all days of the week. As in every facility, you need to get a feel of warmth and high-quality service. Great service complements high-quality, you can expect all these from TravelCar. Not only do we aim to provide you with cheap airport parking, but also avail a fantastic service that you will live to remember. Do you have any questions, concerns or comments for us? Below is a breakdown of our communication channels. Get customer support at any time of the day or night. We are available 24/7. Travelers should note that public transportation to Raleigh-Durham International Airport is infrequent and therefore unreliable on public holidays and the weekends. Additionally, the speed of the buses is highly dependant on traffic on the roads during peak hours. Durham City Center Use either Highway 157 (East-West Expressway) or the New Raleigh Highway (US Highway 70) to access Northern Wake Expressway (Interstate 540). Head South to Interstate 40. Drive through Exit 284B and Exit 285 to reach RDU airport. Raleigh City Center Head North on Interstate 40, Drive through Exit 284 and Exit 285. You can access extra facilities at the airport. The facilities include restaurants, XPresSpa, airline-checking kiosks, bars, ATMs, currency exchange bureaus, USO lounge, seats with power sockets, movie rentals, and Wi-Fi. Other notable features available include TTY units, wheelchair services, and animal relief areas. Do not rely on public transport if your flight is about time. Public transportation is slow during peak hours and unreliable on weekends and public holidays. Public transit has a limitation where luggage is concerned. You are fully responsible for the safety of your luggage and have to carry it all around by yourself. You may want to hire a car rental from TravelCar and drive yourself to the airport in good time. 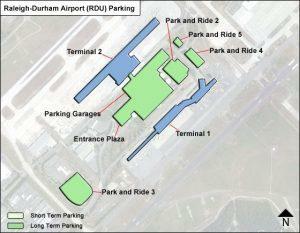 Remember that we offer cheap airport parking at Raleigh-Durham International Airport. Check out the interesting places near Raleigh-Durham International Airport. The areas include Brier Creek Country Club, William B. Umstead State Park, Lake Crabtree County Park, and Brier Creek Reservoir.